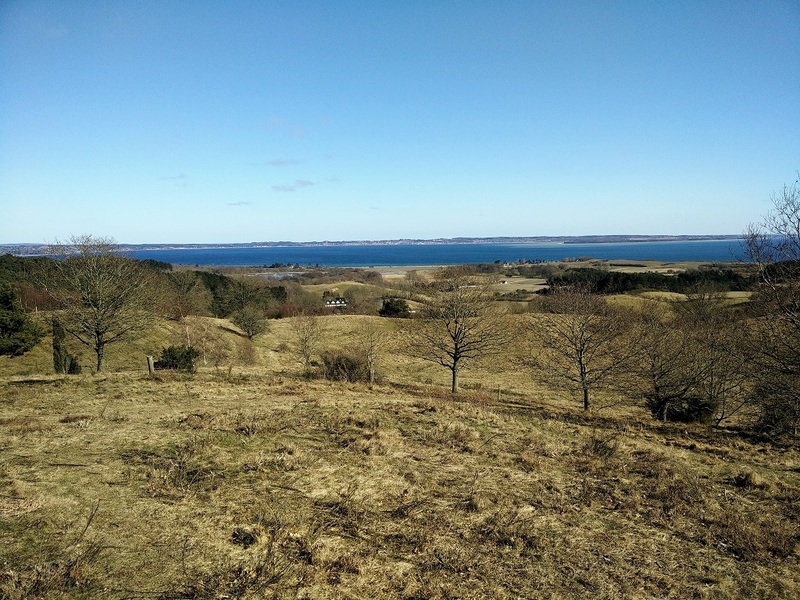 Despite its flatness and little nature (only 12% forest cover), Denmark also has some hidden gems for hiking fans. 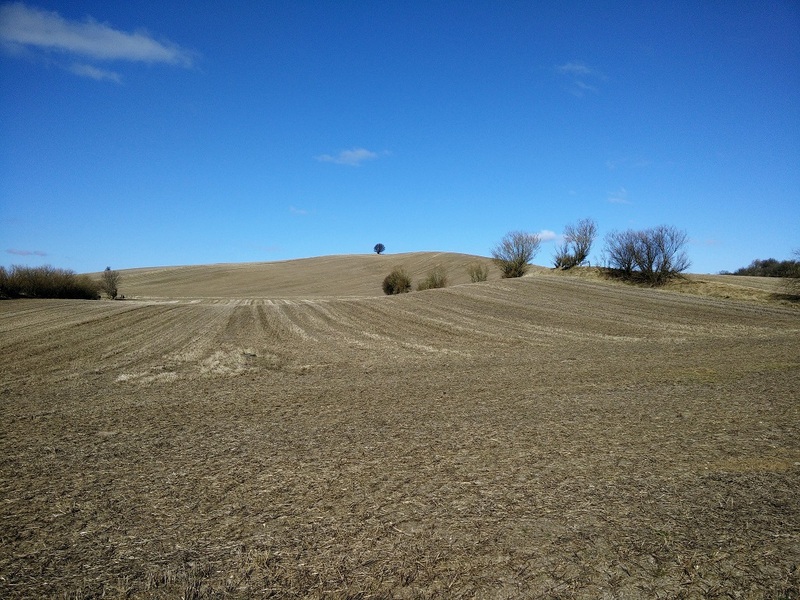 One such area is the Mols Bjerge National Park which lies between Aarhus and Ebeltoft. The hilly national park measures 180 square kilometers and features several attractions such as the Poskaer Stenhus (biggest Neolithic round barrow in Denmark), Kalo Castle Ruin and Tinghulen, besides from outstanding nature. A part of the national park is covered with old oak trees (Skovbjerg), while the rest is covered with windswept heaths. 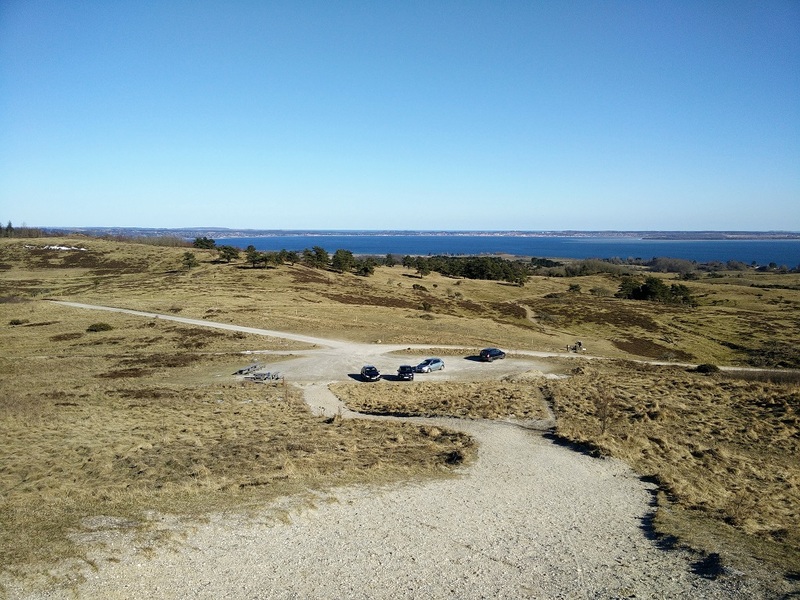 In nice weather you can get a good view on the Ebeltoft and Begtrup bay from the higher hill tops within the national park. However, keep in mind that nice weather is in Denmark the exception rather than the rule. 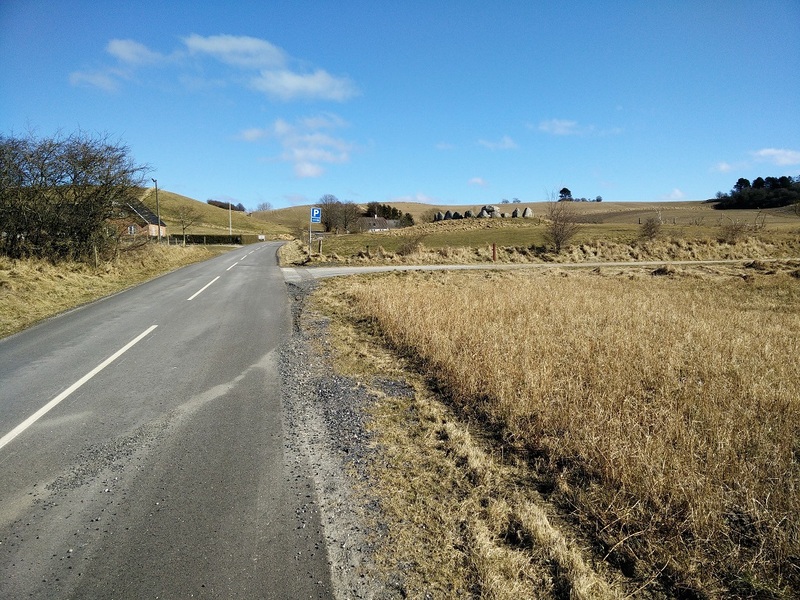 We planned a 12 kilometers long circle route that starts near the village of Knebel and goes through the Mols Bjerge National Park. The route goes past Poskaer Stenhus, Tinghulen and through the Skovbjerg forest. It is suitable for everybody (even for families with kids) and does not require any special equipment. You should, however, be reasonably fit to conduct this hike. 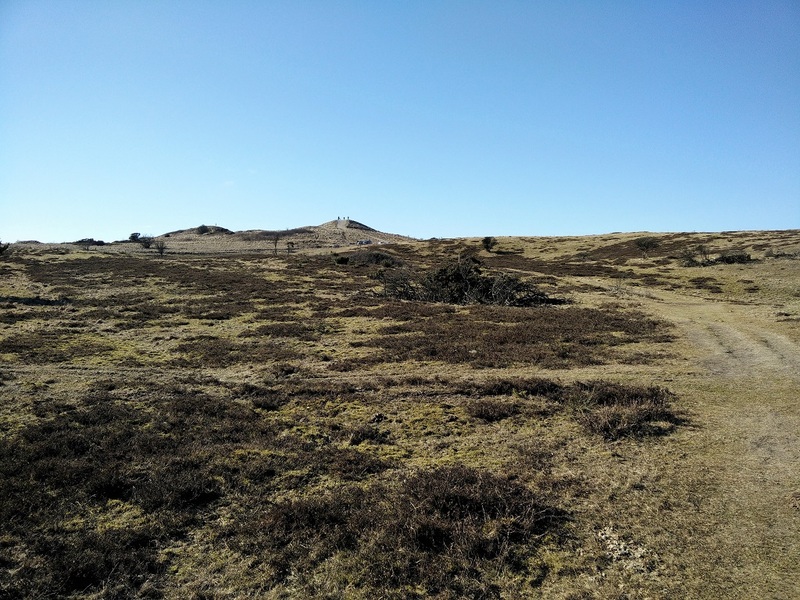 On a sunny March Sunday, we executed this hike which we conveniently named the Mols Bjerge trail and here are the details about it. 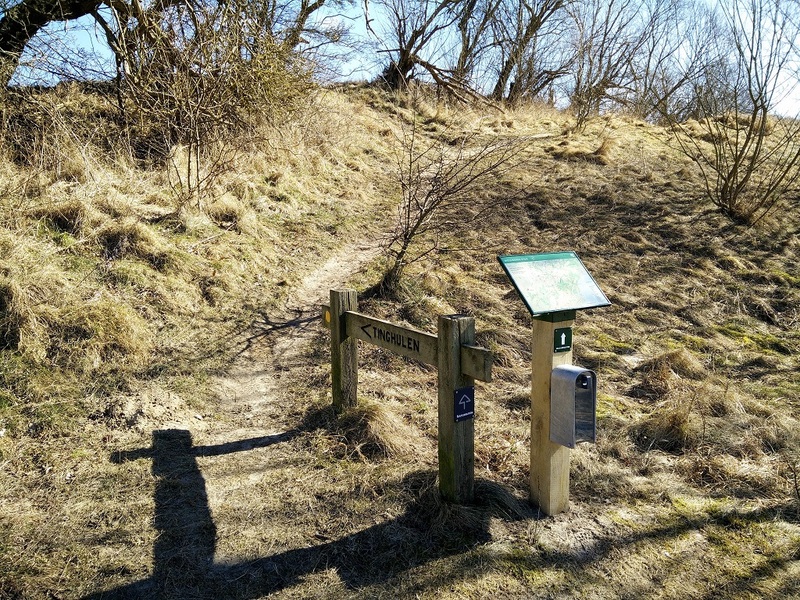 The Mols Bjerge trail starts on a parking place just outside of the village of Knebel. 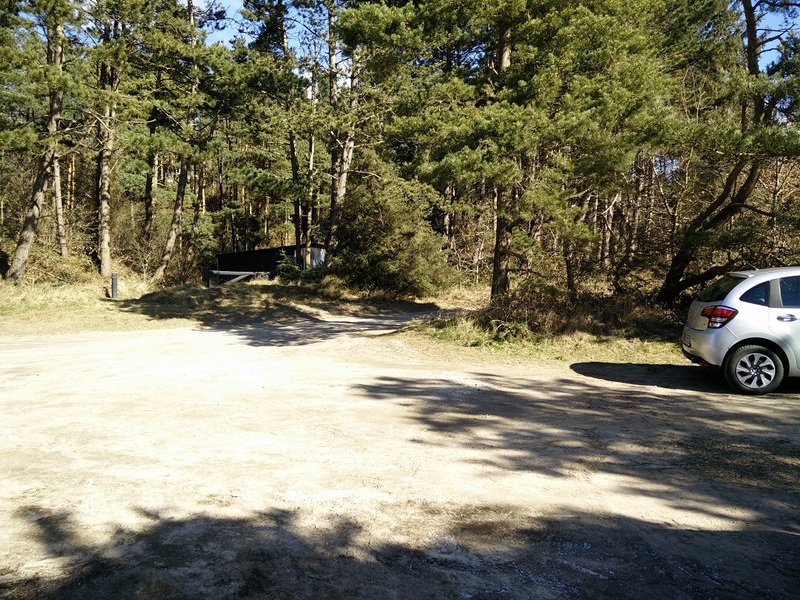 We reached the starting point by car, but you can also reach it by public transport. 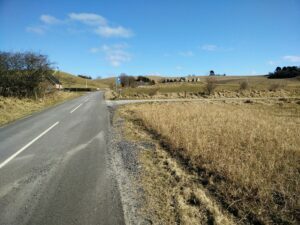 If you do not have a car you should check the Danish travel planning website Rejseplanen to find the best way of travel on any give date and time. The website also shows you an estimated price for the travel. The destination is the Knebel bus station and if you are coming from Aarhus you will most likely have to take bus number 123 to Roende and then bus number 361 from Roende to Knebel. From the Knebel bus station you will have to walk for around 800 meters (Lyngevej – towards east) to reach the parking place where the trail starts (coordinates: 56.2098, 10.4951). If you are coming by car, you should first drive to the town of Roende. In Roende you should continue driving south towards Knebel through the village called Vrinners. When you reach Knebel drive through the village but only till you see the direction sign for Vistoft. Here, turn left and drive on Lyngevej for around 800 meters till you see a small parking place on your left (coordinates: 56.2098, 10.4951). You can park your car there free of charge and the GPX route attached above starts exactly at this parking lot. 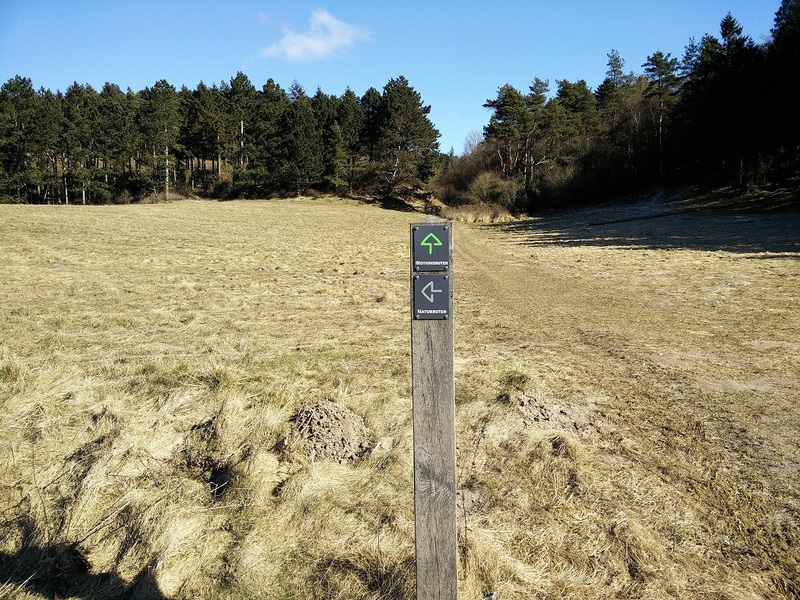 From Aarhus it will take you approximately 45 minutes to reach the starting point of the trail. Since there are many different trails in the area, navigating along our route is not easy. Therefore, we recommend using our GPX track (with a smartphone, GPS device or a GPS watch) which you can download for free above. If you don’t know how to use a GPX track for navigation check out our article What are GPS track and how to use them for hiking. 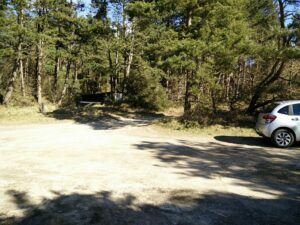 From the parking lot, start hiking on the wide dirt track towards north-east leading into the forest and after hiking for 500 meters you will see a narrow path on your left. Take the narrow path and after 400 meters or so you will come to a big field. There is a direction sign and you should follow the direction of “Naturruten”. Soon you will come to an asphalt route and you should follow it for 600 meters in the direction of north-east. 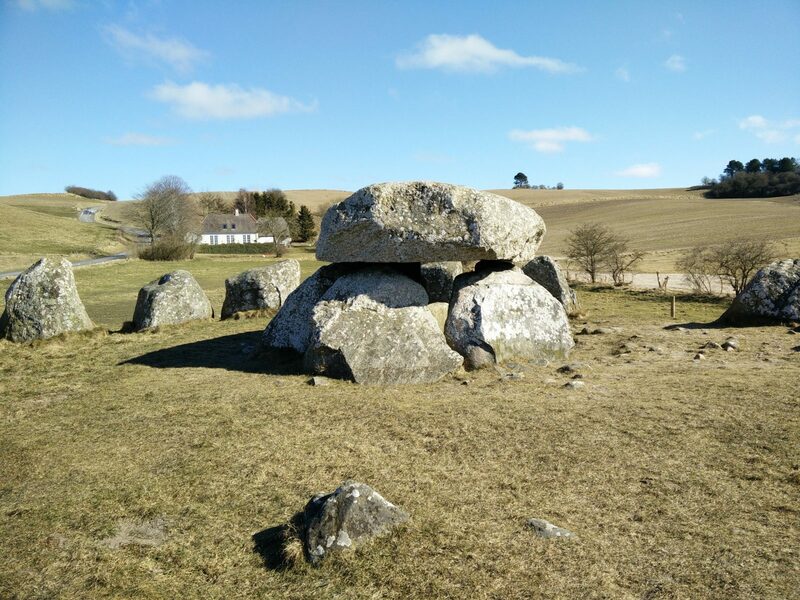 You will then reach the Poskaer Stenhus – the largest round barrow in Denmark which dates to 3.300 B.C. Here the trail turns towards south-east and leads you towards Tinghulen – a 30 meters deep crater-like hole. After hiking through the fields and woods on the ascending path for 1.5 kilometers you will reach Tinghulen. From Tinghulen continue the hike on the path towards north-east and after 2.3 kilometers the path will turn towards south-west. Soon after, you will come to a clearance with a great view on the Begtrup bay. This is also a great place for a lunch break – there are several benches and tables. 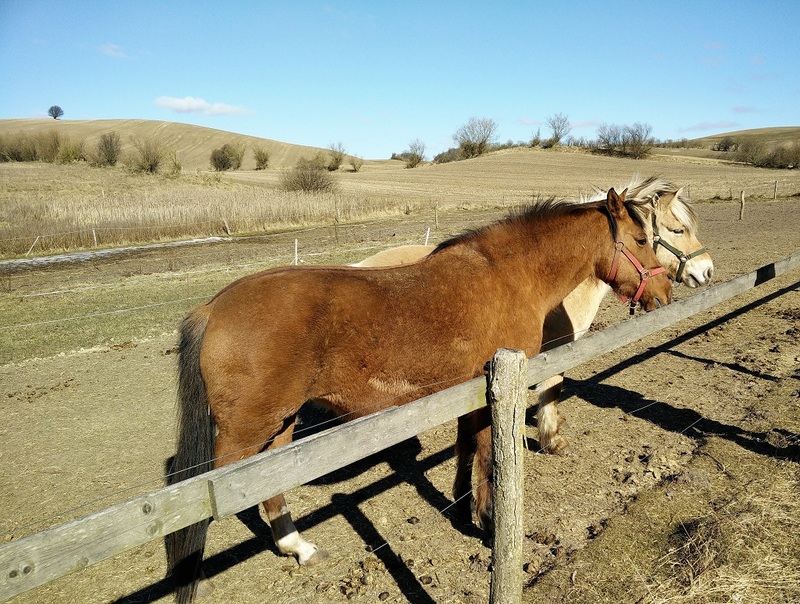 Note that you will several times enter and walk inside enclosures with grazing animals – which is perfectly safe and legal as long as you keep your distance to the animals and don’t cause them any distress. You should therefore keep your dog on a tight leash if you choose to bring it on the trail with you. After the lunch spot, the trail turns towards west and offers a great view on the coast. 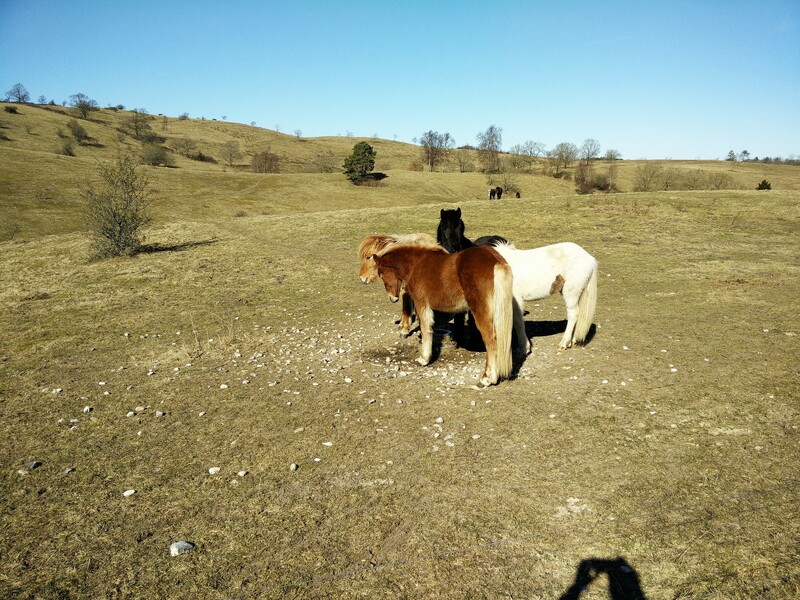 After hiking for 9 kilometers altogether you will reach the Trehoeje – three high hills from where you can get a wonderful view of the surroundings. In nice weather, you can even see Aarhus from there. From Trehoeje continue towards west until you reach a wide dirt track. Then go over the wide dirt track and continue on another wide dirt track that goes towards south-west. Soon you will reach the Lyngevej road. When you reach the Lyngevej road, go right and after approximately one kilometer you will come back to the starting point. Since I knew that the hike would be relatively short, I didn’t take too many things with me. In my Osprey Talon 44 backpack I was carrying my Carinthia HIG 3.0 jacket, food, water and some accessories. 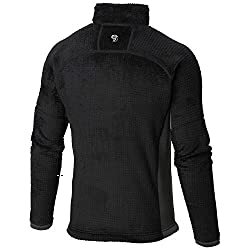 While hiking I was wearing the WoolPro Agena Merino base layer, Mountain Hardwear Monkey Man fleece jacket, softshell pants, Salewa Mountain Trainer Mid hiking boots, Woolx Merino hat and gloves. Because it was quite cold and windy, I had to put on my Carinthia jacket during pauses to stay warm. The Salewa boots were overkill for this hike – I would much rather wear lightweight hiking shoes because the terrain was not particularly demanding, and my backpack was very light. 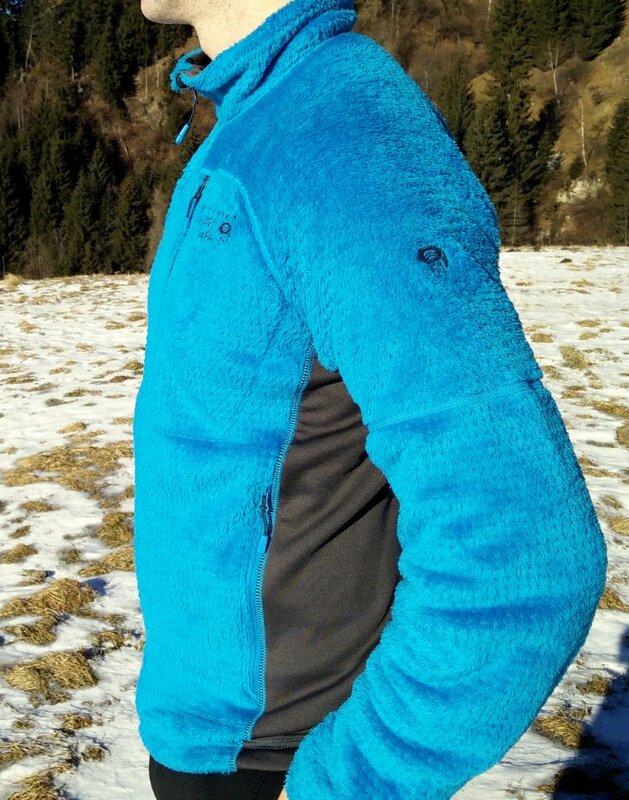 I really like the Mountain Hardwear Monkey Man fleece jacket because it provides great warmth for the weight. It is also very breathable and has three conveniently placed pockets. However, on this hike it was too cold to only wear the fleece jacket and while wearing the Carinthia insulated jacket over the Mountain Hardwear jacket I was too warm. 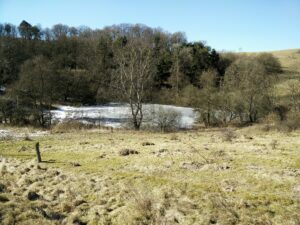 Therefore, I would prefer a thinner (less warm) fleece jacket for this hike, so that I could wear it together with the insulated jacket. Nevertheless, the Mountain Hardwear Monkey Man is still my favorite fleece jacket because of its superb weight-to-warmth ratio. The Mols Bjerge trail is not very demanding and can thus be done by everybody. 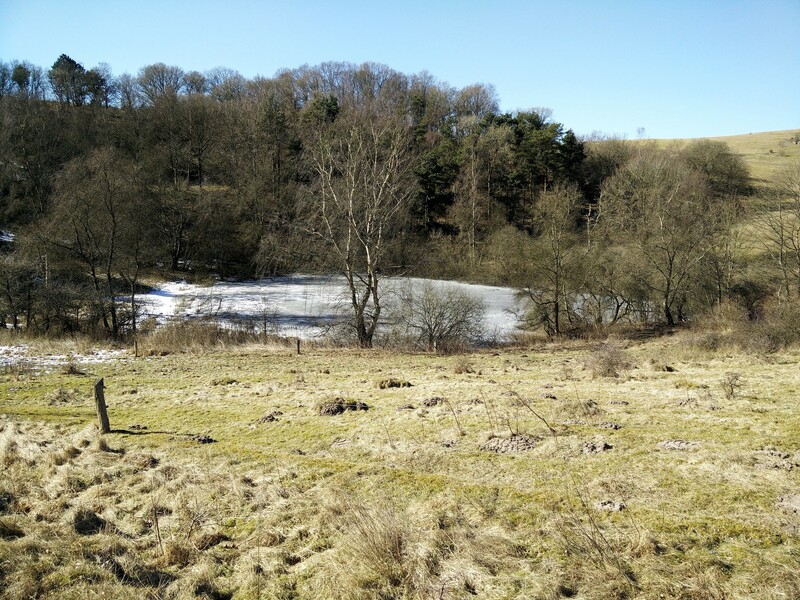 It is a great option for people living in Aarhus or other cities nearby that want to spend a day in pristine nature. 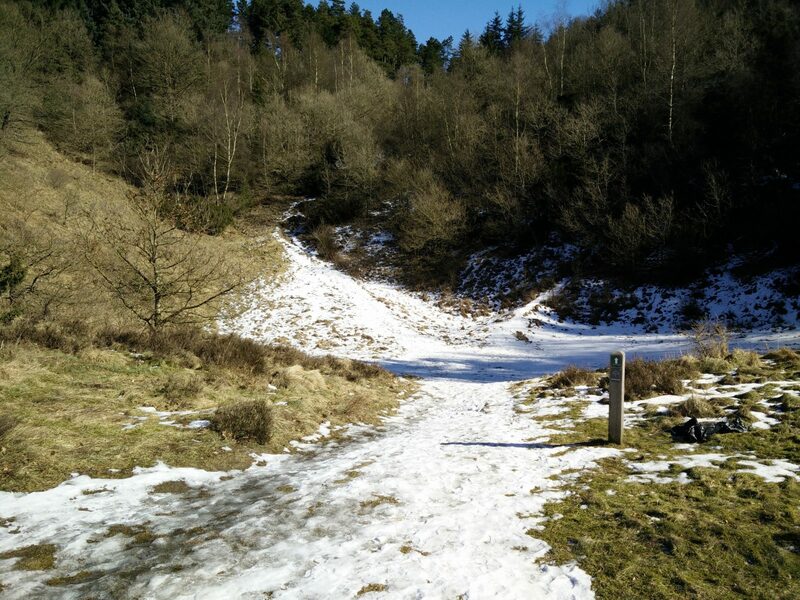 The trail will take you through beautiful landscapes and past some attractions such as the Poskaer Stenhus. Don’t forget to bring enough water and food. If you are lucky and you get nice weather, also bring sun cream.